Over three and a half years. That’s how long it’s been since I’ve stepped foot on the 79 miles of Tunxis Trail. Three years and eight months. 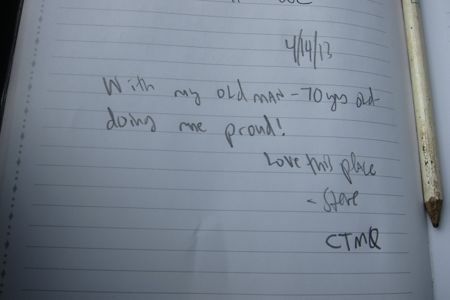 As pathetic as that is, it also highlights how great the CT 400 challenge is. 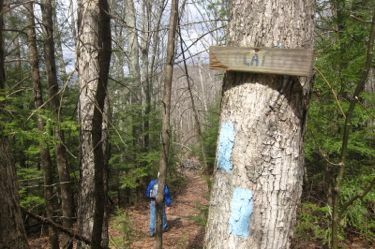 It’s not going anywhere – despite all the relocations, closures, and additions that are a constant fact of Connecticut hiking life. Another constant is the ever-changing state of Satan’s Kingdom related signage. 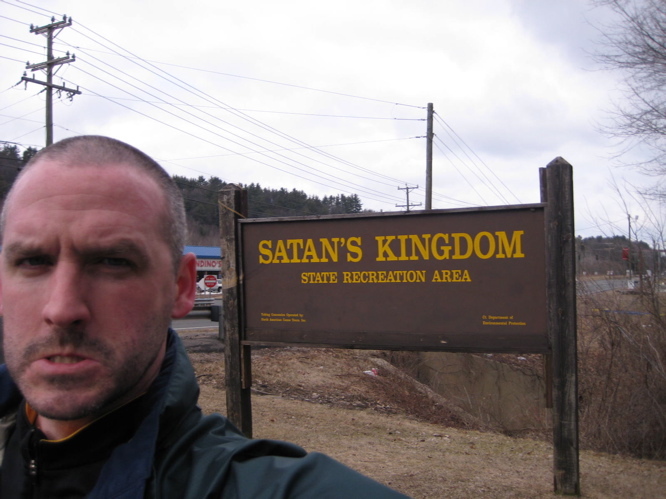 I used to get a kick out of updating you all on the existence (or not) of the Satan’s Kingdom road sign. You can see that here. Now, in April 2013, some jerk has spray painted over “Satan’s” on the big brown recreation area sign across route 44. Lame. I noticed that I didn’t really post any pictures from my hike up Satan’s Kingdom Road, along the gorge, in my last report. I don’t know why – but I also know I don’t want to bother finding them in order to post them. Suffice it to say, people DO live in houses on that road, at least at the northern end up near route 44. 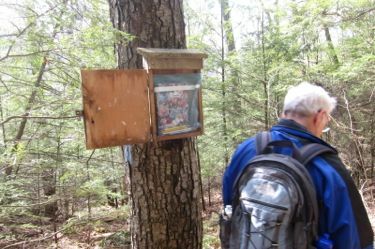 I have done a lot of the Tunxis Trail hikes with my friend Rob, but as we both have two little kids now, we just never seemed able to connect to progress north. So with my parents in town for several days, I convinced my dad to do this section with me; which meant that I didn’t have to do my usual “out and back” hike. I would have a car spot! Hosanna! Oh… and the fine company of my pops. My dad is 70. 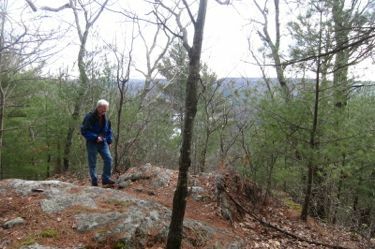 So ask yourselves again why a 70-year-old man from Delaware has hiked one of the coolest 8 mile sections of CT hiking and you haven’t. Hm? Get out there! I’ve detailed Satan’s Kingdom elsewhere on this site, so no need getting into it again. The Tunxis from route 44 here in New Hartford, across the Farmington River (east branch) and north up to the Massachusetts border is remote and beautiful. There are no other “official” side trails or loops, which is pretty strange when you consider the rest of the Tunxis south of here. It’s like the trail just completely changes personality. I had warned my dad, but I still think the fairly steep climb of the first half-mile or so was a shock to his system. There are switchbacks here and it’s really not too bad. For years, I’ve been under the impression that this section of the Tunxis climbed up above Ski Sundown. It does not. It does climb almost all the way to the ridgeline, but hits a weird road and veers left and then down and back up and around a transmission line in what is clearly a screwed up bit of relocation work due to property rights. I’m used to this stuff around here by now, but my dad was a bit confused. Fortunately, the gradual downhill of the next ¾-mile or so eased the sting a bit. Note: At one point, there is a random trail register on a tree near a brook crossing. This was placed here by a woman in memory of her mom and it’s a lovely idea. Unfortunately, when the box is open, it conceals the double blaze and the woods road continues straight. Yes, we continued straight down the hill (per the map) for too long before realizing our error. The Walk Book (2006) does mention the possibility of a future re-route here and yes, it happened. 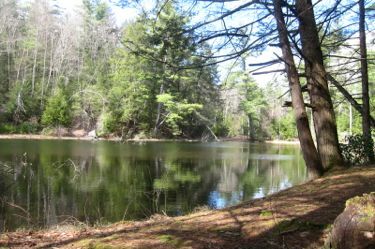 The “new” trail (which is probably pretty old by now) descends down to the same little dammed lake along Ratlum Brook that the old woods road does, but you know me: I must follow the trail. 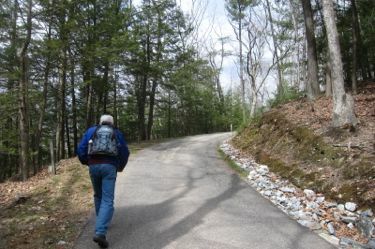 Like when the Tunxis crosses Ratlum Road the first time and then ascends straight up a little hill simply because there is a cleave in the rocks on top and the trail can take the opportunity to squeeze through it. That’s it. That’s all. 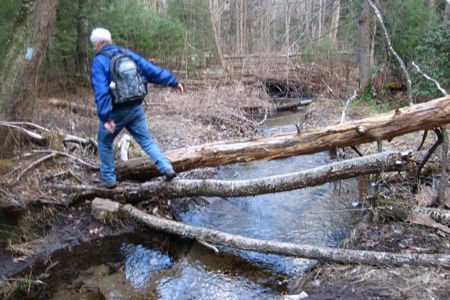 That, my friends, is what makes a CFPA trail a true CFPA trail: Find split rock feature, route trail to walk through it, no matter the silliness of doing so. Back down the hill to Ratlum Road in front of the Ski Sundown entrance for some reason. Again, why? (Pardon me, you’re not looking at a map but basically, if you’re going to take me up the little hill to walk through the rock instead of a simple – and short! – road walk, then keep me in the woods heading due north to where the trail ends up anyway? Again, I’m sure it’s a private landowner issue. At least I hope it is. 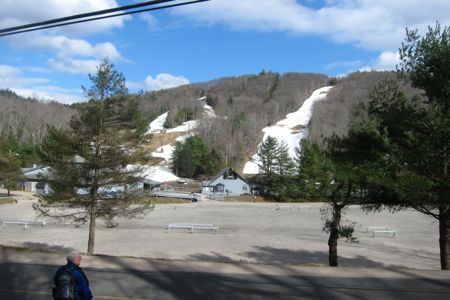 Either that or Ski Sundown donated some money to the CFPA and this is their thank you – routing a trial to its doorstep so people like me can look up at the ski runs and say ooooh and ahhhh. 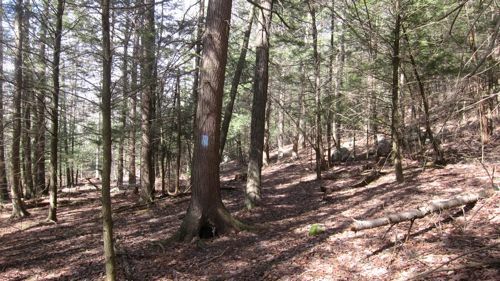 Back into the woods, through a swampy area and then a healthy incline up to another ridgeline up above Lake McDonough. Lake McDonough is completely man-made and is a little hard to explain. 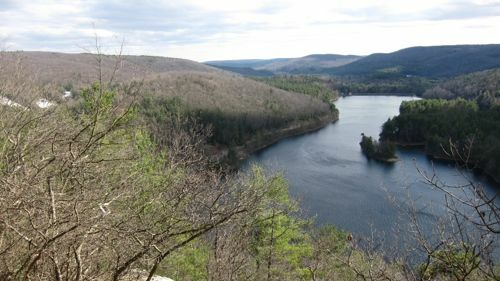 It’s a compensation reservoir for the huge Barkhamsted Reservoir to its immediate north. It serves as a beautiful recreation area with a beach and allows for boating and fishing and stuff. The Farmington River east branch is its outflow, and Lake McDonough is more like a giant bathtub to help control Barkhamsted Reservoir. It was at about this point in our hike that my dad was wishing for a bathtub. 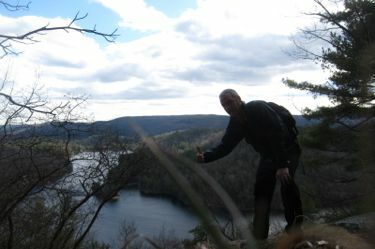 We took the little spur trail out to the view of Lake McDonough and rested a bit. I imagine that in mid-October, this is quite a stunning place to be. After returning to the main trail and ascending a little bit further, the next few miles of the Tunxis are relatively flat, impossibly quiet and feel really, really remote. 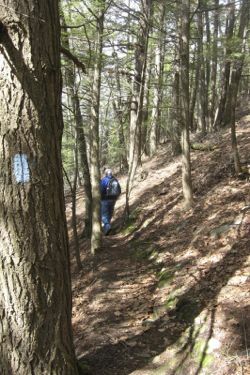 At one point, the trail crosses over into Barkhamsted. 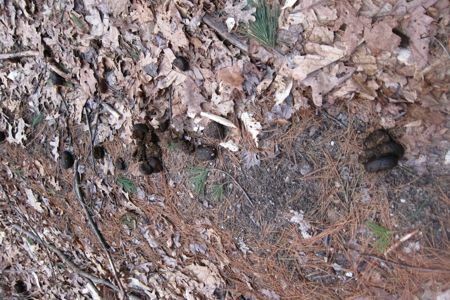 This is marked by a trail register put in place by the Northern section volunteers… I’m guessing. I gave some props to my pops for plugging along at a decent pace. I noticed an odd structure off the trail to the east at one point and went to go check it out. 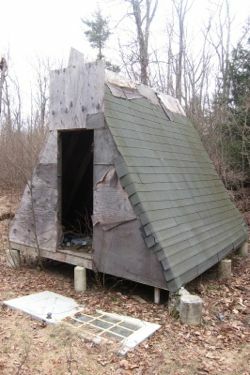 I’m guessing this is some hunter’s shelter of some sort. It was fairly well trashed and I wouldn’t want to sleep in there, but then again, I’m not a hunter. I picked up a bunch of beer cans and caught up to my dad. We passed a mysterious little obelisk right along the trail, in the middle of nowhere. It says: 476 HWW 1920. You figure it out. 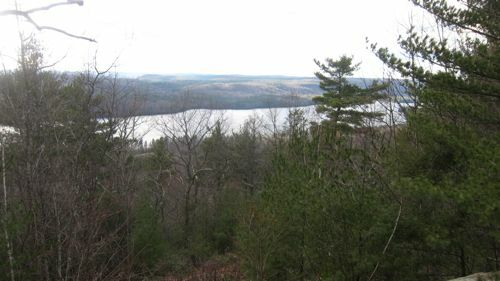 A few more downs and a few more ups, another stellar view – this time of the Barkhamsted Reservoir proper and another crossing of Ratlum Road. I offered a rest to my dad and said I’d go on to get the car and pick him up, but no, he pushed onward and, unfortunately for him, one last upward. I should take a quick moment to give a quick little history of the reservoir, but I’ll save the good stuff for the next (last) section. The reservoir was created in the 1940’s after 10 years of the MDC buying up the land to do it and 10 more years of building and waiting for it to fill. The 135 foot tall, nearly 2,000 foot wide Saville Dam is beautiful and is one of the most attractive places on earth at peak fall foliage. And the fun part that comes with this sort of thing: The reservoir flooded many buildings and farms of Barkhamsted, including the village of Barkhamsted Hollow. Like I said, we’ll learn more about all of that on other pages. 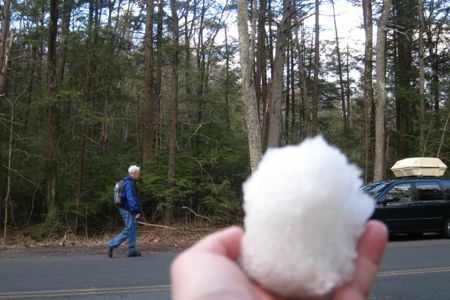 For me and my dad, the end was near and after a quick descent through some laurel and birch, we reached route 219 and our car. It’s funny, in a way, there’s not much to describe from this hike. Only a couple lookouts and I guess the Ski Sundown thing was cool, but really, nothing crazy. Yet, that’s perhaps what makes this section so great to me? it’s remote and even when it’s not, it feels like it is. 80% of it is under the canopy of white pine and hemlock, meaning each footfall was soft and quiet. I expected to see bears, but we had no such luck. 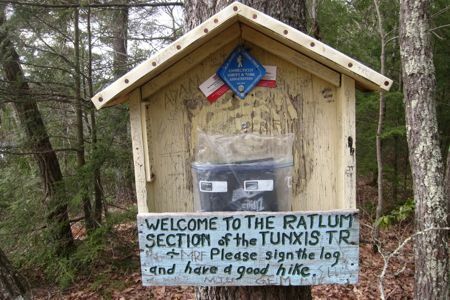 I’m eager to finish up the Tunxis soon and who knows, maybe my dad has one more 13-mile hike in him. HWW is Hartford Water Works, later turned into (or purchased by) the Metropolitan District Commission. Stone is possible a property line marker. 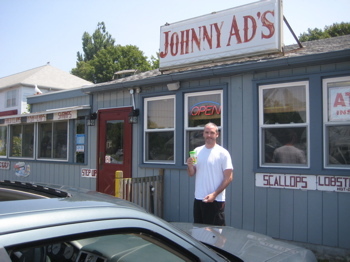 Love the write-up, and kudos to your dad for making the trek! great info, thanks! 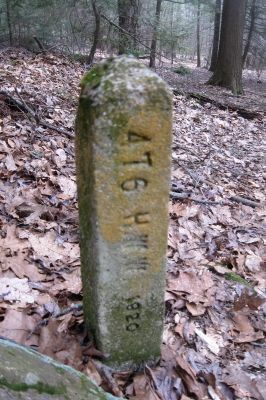 The marker was maybe a mile north of the New Hartford/Barkhamsted line, for what that’s worth. Just did this with a friend on Saturday, although we did it going south and finished at Ski Sundown just in time for the start of their brewfest. We were too wet and muddy to go get a beer, though. By the way, the Farmington River Watershed Association has a tour of the Saville Dam and Old Barkhamstead Hollow on October 26. Looks interesting. Thanks for writing about this hike. I had been waiting for it! Lake McDonough is a no-wake zone. The boats can only run their engines at idle. There is no loud droning noise coming from the lake. It’s relatively quiet, even on the busiest day.